Salam buat semua... nothing much to share with you since I can't snap any photo yet because my camera was lost when coming back from hajj... dah takde rezeki... in other way, this is my chance to buy a new one... hehe... (sambil senyum2 kat my hubby.... :) senyum ada makna tu... hehehe teringat movie P.Ramlee dalam Madu Tiga...) but until now... I can't find any... I'm still browsing, dah kelabu mata dah (bukan mata kelabu tau... :0) tak tau nak beli yang mana satu... Kawan2 ada cadangan tak kamera apa yg bagus? Brand? 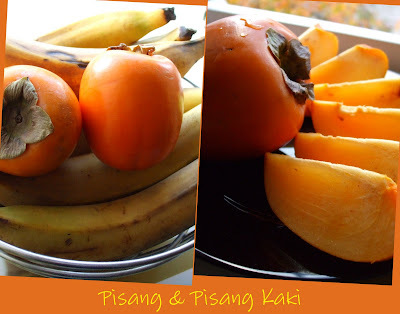 Just want to share this autumn photos... dah lama dah amik gambar ni... sekarang dah winter... sorry ye kawan2... Gambar Pisang dan Pisang Kaki (Banana and Persimmon).... ha....sebut pasal pisang kaki, I tak taulah u all panggil buah tu apa, but my family and my hubby's family panggil pisang kaki... U all nak tau tak pasal apa paggil pisang kaki...sebab nama species buah ni Diospyros kaki atau singkatannya D. kaki. Here, this fruits usually came from Spain and in season from mid-October to the beginning of December. The Japanese Persimmon or kaki (柿) (Diospyros kaki), "shizi" (柿子) in Chinese, is the most widely cultivated species. These are sweet, slightly tangy fruits with a soft to occasionally fibrous texture. This species, native to China, is deciduous, with broad, stiff leaves. Cultivation of the fruit extended first to other parts of east Asia, and was later introduced to California and southern Europe in the 1800s, and numerous cultivars have been selected. It is edible in its crisp firm state, but has its best flavor when allowed to rest and soften slightly after harvest. The Japanese cultivar 'Hachiya' is a widely grown cultivar. The fruit has a high tannin content which makes the immature fruit astringent and bitter. The tannin levels are reduced as the fruit matures. 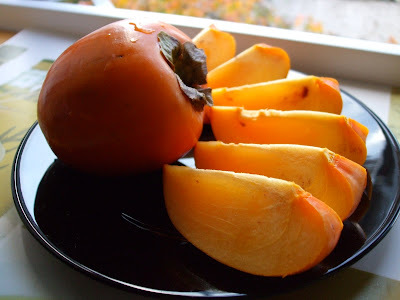 Persimmons like 'Hachiya' must be completely ripened before consumption. When ripe, this fruit comprises thick pulpy jelly encased in a waxy thin skinned shell. "Sharon Fruit" (named originally after Sharon plain in Israel) is the trade name for D. kaki fruit that has been artificially ripened with chemicals. It is also known as the "Korean Mango". The heart-shaped Hachiya is the most common variety of astringent persimmon. Astringent persimmons contain very high levels of soluble tannins and are unpalatable if eaten before softening. The astringency of tannins is removed through ripening by exposure to light over several days, or artificially with chemicals such as alcohol and carbon dioxide which change tannin into the insoluble form. This bletting process is sometimes jumpstarted by exposing the fruit to cold or frost which hastens cellular wall breakdown. These astringent persimmons can also be prepared for commercial purposes by drying. The non-astringent persimmon is squat like a tomato and is most commonly sold as fuyu. Non-astringent persimmons are not actually free of tannins as the term suggests, but rather are far less astringent before ripening, and lose more of their tannic quality sooner. Non-astringent persimmons may be consumed when still very firm to very very soft. There is a third type, less commonly available, the pollination-variant non-astringent persimmons. When fully pollinated, the flesh of these fruit is brown inside -known as goma in Japan, and the fruit can be eaten firm. These varieties are highly sought after and can be found at specialty markets or farmers markets only. Tsurunoko, sold as "Chocolate persimmon" for its dark brown flesh, Maru, sold as "Cinnamon persimmon" for its spicy flavor, and Hyakume, sold as "Brown sugar" are the three best known. Before ripening, persimmons usually have a "chalky" taste. They should only be eaten when ripe and soft.